Episode three of Telltale's Minecraft Story Mode adventure series is out, and seems to be taking a creepy turn. 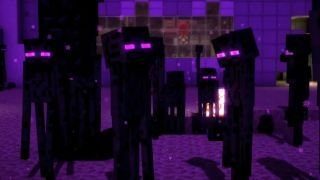 A wither storm is eating the world and the Endermen are massing. Where normally you might dig a three block hole and hide until the sun comes up, the Telltale game compels you to stand up and save the world, probably by fighting a big dragon in hand-to-hand combat. That always ends well. Hopefully it doesn't get quite as grueling as The Walking Dead. Will Reuben the pig make it through alive? More importantly, will the series pick up a bit after the first episode left Tyler cold? The series costs £18.99 / $25, and is available from Telltale, the Humble Store, Steam and Gog.